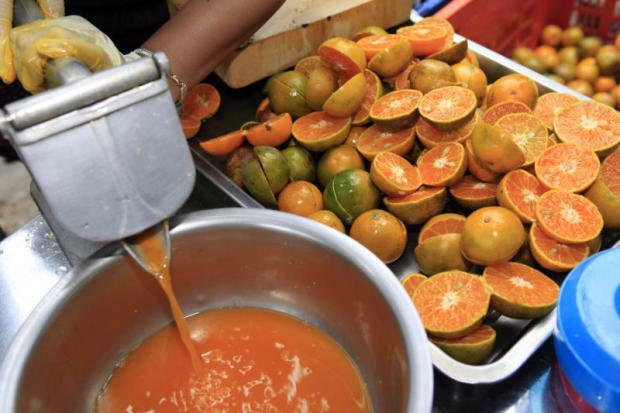 Recent reports about fake orange juice sold by street vendors not only bring up a health issue but also hint at a legal loophole. First it was vendors in Saraburi province who were caught redhanded late last month while mixing orange concentrate with tap water and colouring additives. Second, a street seller in Bangkok was seen filling plastic bottles with a suspicious orange liquid, with his photos captured while in action circulated online. Then, six vendors in Yaowarat area were raided, with their bottled orange and pomegranate juice sent for further lab examination to find out if they were fake. The recent string of news about the sale of suspected fake fruit juice has sorely shaken the confidence of consumers, who find these beverages cheap and convenient. Mostly available at street carts at prices ranging from 10-30 baht a bottle, readyto-drink juices, especially orange, are a favourite thirst-quenching option especially among the middle- to lower-income group. These drinks often claim to be 100% fresh and natural. Patchara Klaewkla, food alert system officer and co-ordinator at the Foundation for Consumers, said that these are cases of one rotten apple that spoils the whole barrel. Vendors who sell fake juice tarnish the reputation of the rest and now consumers are weary when they are to buy juice from carts. “The moral of this story is if consumers buy things from places they are not familiar with, be prepared for risks. And now they cannot just go blind and buy what they want from anywhere they want. They just have to be more vigilant,” said Patchara. This episode is not just a health but also a legal headache, said Assoc Prof Pornrat Sinchaipanit, head of the Food Science and Technology Division, Mahidol University Institute of Nutrition. Bottled fruit juice from street carts, fake or not, actually comes down to how the products are defined by vendors. For clarification, Pornrat cited the Notification of Ministry of Public Health (No.356), which addresses and defines beverages in sealed containers. According to the notification, products labelled as “100% juice” means it is made from real fruit. Those labelled “100% juice from fruit concentrate” are beverages which are made from concentrated fruit juice and when diluted shall be of the quality or standard stipulated. “Products which are labelled ‘juice drink’ are required to contain or be made from no less than 20% fruit content. If the beverage makes up of less than 20% of fruit content, it should be called a fruit-flavoured drink. On the other hand, if products contain no fruit content at all or are made from artificial fruit extracts, they are required by law to be labelled fruit-scented beverages,” Pornrat explained. That said, the sale of orange or any other kind of juice from street vendors will be considered illegal only when the products do not contain contents as stated in the label. If that is the case, then they can subsequently be branded as fake. For large- or factory-scale manufacturing, consumers have Good Manufacturing Practice or GMP as a system to ensure that products they buy are consistently produced and controlled according to quality standards. But for small-scale production, Patchara said that in Thailand, the Food and Drug Administration (FDA) has enforced another quality-control protocol called Primary GMP, which is quite similar to factory-scale GMP but less serious in practice. Both forms of GMP look to ensure that six manufacturing aspects – production buildings, equipment, production process, sanitation, maintenance and production staff – are up to hygiene and safety standards. The coordinator of the Foundation for Consumers added that juice drinks that are manufactured in factories or by large-scale industry are already required by law to be properly labelled and seek the FDA certification. But the problem here is juice that is made and sold by small-scale vendors, which is not licensed. These products, even though sold on the street, are subject to control by the Primary GMP standard, but Patchara is not certain how strictly the FDA has implemented the quality-assurance approach. “Manufacturers might take advantage of this legal loophole,” he added. “They might produce juice drinks that are not properly labelled and supply them to vendors. Vendors might claim these are their own products [which will then be loosely controlled because they are small-scale production] but in fact they receive them from big producers. Speaking of adverse health impacts from fake fruit juice, Pornrat does not want consumers to be overly alarmed. He said fake fruit juice is less likely to cause short-term health consequences given the citric acid content of fruit juices is able to lessen the proliferation of germs to a certain extent. Long-term impacts, nonetheless, are likely to stem from the fruit that might be loaded with pesticides or colouring additives that might carry toxic heavy metals and water that might be of poor quality. Pornrat, however, is not convinced that producers have added saccharin – a type of artificial sweetener widely used in preserved fruits – to bottled fruit juice as speculated. For safety, Pornrat suggested that consumers only buy fruit juice from vendors or carts they are familiar with. “Consumers need to keep a watchful eye on people who sell them food and drink,” she advised. “Check if they and their products look clean, how they wear their hair, things like that.” If worse comes to worst, according to Patchara, street food licensing might be a good way to go. Putting aside legal protocols, social measures are also paramount in making sure street-side fruit juice is safe for consumption, said Patchara. Markets and authorities in the area where products are sold should also play the role of watchdog checking if things available there look suspicious.